I have just returned from an amazing time visiting our most recent project where participants can take part in a zookeeper internship. This is such an exciting opportunity and one which many students of animal care, animal management and zoology have expressed an interest in. Participants will not only be working alongside zookeepers gaining experience, but they will also be working to improve animal welfare standards in the zoo. Let me tell you more! My stay in Malaysia started in the vibrant city of Kuala Lumpur. KL is like no other city that I have seen before in Asia: towering skyscrapers and futuristic business districts really dominate the skyline, but a quick nip down a side street take you into the heart of a buzzing Malaysian street scene, and Chinatown provides an eclectic mix of colours, sights and sounds. The city is an exciting place to visit and a great setting to familiarise yourself to the country. 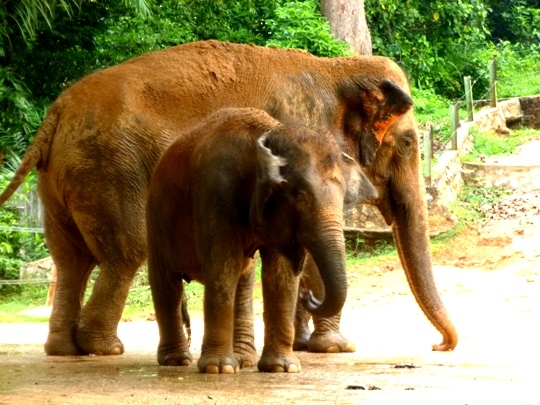 My trip first took me 2 hours out of Kuala Lumpur to the second largest zoo in Malaysia. Here volunteers work closely with the zookeepers to improve the lives of the animals living here in captivity. Captivity hardly felt like a way to describe it however: this was the greenest and most beautiful zoo I have ever seen. Set on the banks of a meandering river and with huge trees and plants dominating the area, the zoo’s space was impressive. The role of the volunteers here is to help the zoo to improve the living standards of the animals in their care, ensure that they develop an enrichment programme and to maintain the enclosures. Enrichment is the most important part of this project, and one that is often the least understood in Asia, where animal welfare in zoos has a lot of catching up to do. Enrichment helps the animals to maintain and develop their wild instincts, enabling them to live life as they would in the wild. I was really excited by the work that is being carried out here, and amazed that you can be doing something incredibly beneficial whilst also learning the ropes of being a zookeeper. This is an excellent opportunity for everyone wanting to improve the lives of animals, but can tie in directly with great work experience for those looking at going into a related career. For more information about this project, visit our zoo assistant internship webpage.